Submitted by Alexander on Tue, 03/06/2012 - 07:14. Since we have already covered amp modeling software, this time we will focus on software that provides quality guitar effects. These popular software effects applications will get you as close as technologically possible to your favorite stomp box and rack mount effects - minus the bulk, weight and the hassle. Note that certain packages excel in specific effect types, so do check out your favorite effect types via the demos before you decide on which is your top pick. We have included both paid and free guitar effects software for you to sink your teeth, and mouse, into. These are the top commercially available guitar effects programs. Most of them are considered as amp modeling software as well, because they usually include both amp and effects modeling in one package. If you want to test the waters, here are the some of the best free guitar effects software packages. Aside from the limited freeware software, there are Lite or Trial versions of commercial programs which you can get for free, but with limited in features. The good thing though is that even when they lack features, they work and sound just as nice. If you prefer the Linux platform, then Guitarix is your best free guitar effects solution. It is a free, full featured guitar amp and effects software. Aside from its impressive amp modeling capabilities, Guitarix has 25 equally impressive effects modules. Effects include a noise gate, modulation effects like flanger and phaser and it even has weird stuff like auto-wah. Guitarix's low latency audio engine ensures respectable audio, which is said to give you not more than 10 milli seconds of delay. This is a simple yet effective guitar effects software, unfortunately it is only available for Linux users. The SimulAnalog Guitar Suite is an old but still popular free guitar effects program. It contains a set of VST plugins that emulate some of the most common used guitar effects and amps. It has simulations of five essential guitar effects which include Boss DS-1, Boss SD-1, Tube Screamer, Oberheim PS-1 and Univox Univibe. The SimulAnalog Guitar Suite was born out of an academic research and thus applies a zero deception, no marketing hype approach. The interface is very basic but the sound is said to obtain lass than -40dB of difference compared to the original hardware. AmpliTube Free is a cool entry level program for those that want to experience software based guitar effects and amp modeling without spending money. It only comes with 9 stompbox and 2 rack type effects, but it covers essential effect types which are good enough for various musical genre applications. Should you need more, AmpliTube offers an upgrade system in which you can shop for additional amps, cabinets, mics and effects. Each model can even be tried out for free for two days prior to purchase, quite impressive for a free software! 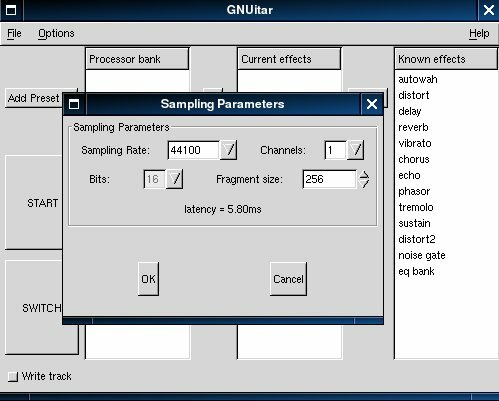 GNUitar is a basic free guitar effects software that allows you to turn your PC into a guitar effects processor without having to spend a single dime. Nothing much needs to be said aside from it is working as intended. Although you don't have too many options, it has all the essential effect types including distortion, reverb, echo, delay, chorus, flanger, equalizer, wah, phaser, tremolo, vibrato and noise reduction. The package comes with 2 different types of distortion and has various flavors of echo, reverb and delay. This free software works for both Windows and Linux. Posted by Anonymous on Sat, 12/22/2012 - 17:24. Posted by Jason on Thu, 08/01/2013 - 20:40. Posted by Anonymous on Sat, 01/10/2015 - 00:46. Don't waste your time. I spent hours going in circles and its custom shop doesn't let you play or try ANYTHING. Hoax to get you to buy the greeeeeedy program! Posted by jlrocker on Sun, 07/26/2015 - 17:25. Posted by JWeaser on Thu, 04/18/2013 - 08:08. Posted by Harald on Sun, 03/22/2015 - 11:05. I think it´s marvelous that i can use my computer and audio/MIDI interface, not just for software amps, cabinets, mics and effects for my guitar, but also for the entire band and record on the computer with my DAW energyXT 2.6 when i play live. Posted by Joseph on Wed, 11/25/2015 - 03:07. You should add the plugins on Igniteamps.com They are all free and are great. They use them as tools to help them design physical amps, so they are very accurate and almost zero-latency. They have a few amps and pre-amps, 2 OD pedals and even a cab modeller which is more than enough to get you started. The Emmisary is a freakin' miracle. It can do any tone (I use it for metal, blues, clean) but it's best for molten, in-your-face heavy metal since it has a 4-way EQ on the lead channel. Some great IR's by Redwirez are available for free at their website as some kind of 25th anniversary thing, and if you use windows you can use VSThost as your "DAW" although all it does is host plugins. It's great because it loads so much quicker than a full DAW and doesn't have all the tricky options that just distract you from playing guitar. Like a real amp, it's plug-n-play (after setting it up, of course--- you'll want to set the sample rate to 192khz so that you can get ~8000 samples a sec with oversampling at 4x on each plugin). It can record, too, so it's a really easy, simple solution. Of course, you'll need a real DAW to mix and master. Check out BedroomProducersBlog for a great round-up of VST effects. Posted by Anonymous on Sun, 01/31/2016 - 01:05. Hi, If you are looking for guitar softwares and interfaces to use the softwares. Please search Tone Shifter. Now it is on its third generation Tone Shifter 3. We are just launching a Kickstarter project online. We build this just to MAX the benifits of using software effects. It will be able to use along with JamUp, Bias, Ampkit, ToneStack Go, GarageBand as well as the ones in Mac OS and windows such as amplitube, guitar rig, overloud, revalve and so on. Basicly it is a HD digital sound interface plus with a MIDI controller and footswitch. It is has unique design with different HOST mode and switching MODE to work with the host softwares. We are proud of that it is now maybe the best thing you can find to use on stage with software FX. The special designed analog signal chain mixing with the digital codec give the best dynamic response and sound quality. We did AB with lots of other interface and be so confident on its performance. Also, it can be used to control all the hardwares along with MIDI IN connector. Lots of users for fractal AXE FX2, kemper profiling Amp, G-major, and other ranks are just so happy with this device that are much more portable, light comparing to those original controller. The MIDI control is no latency at all. Search online in Kickstarter, youtube, facebook you may find more details. Ampkit is good and it takes less CPU resourse I think. So it can run smoothly even with some old ipad / iphone. And it sounds not bad and with lots of peavey's characteristic. Also it has ReAmp function which you can record the dry signal and redo the whole effects chain later. It is really cool for recording. I should say each software has its own pros or cons but that is just the same thing of using hardwares. But you can have hundreds of effects and amps with only tens of buck which is something can't be imagined with hardwares. I feel it is so worthy to have the softwares.